A New York couple, Jack and Marion, spend two days in Paris on their way back from their European vacation. They stay with Marion’s parents, which isn’t ideal. Their relationship seems to flounder under these circumstances and with the extra pressure of Marion’s ex-boyfriends emerging onto the scene. They say so much, Jack and Marion, but I don’t believe they really say anything to each other at all. 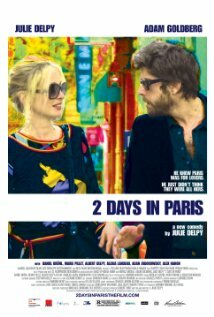 It’s not clear whether their relationship will survive their two days in Paris. I usually like Julie Delpy, but I didn’t warm to her in this role as a rather irritated, (and irritating?) insecure woman. Goldberg’s character himself was neurotic and lacking in confidence. Together they are a terribly flawed couple and they got on my nerves. I didn’t find the film flowed very well, it was punctuated by sessions of inwardness. Many critics thought this was ‘edgy’ but I needed more resolve and forward movement. I do, however, love the scenes in Paris. The sequel is 2 Days in New York which I actually saw first. Funnily enough, I found the dialogue in that film a bit annoying as well. I feel that Delpy (as writer and director of both films) wants to introduce too many eccentricities into her characters – it ends up being a bit meaningless, trying too hard to be offbeat. ‘Offbeat’ needs to come with less effort. All in all, they aren’t bad films, I just don’t enjoy them as much as other truly French rom coms. Posted on 17/09/2010, in french rom coms, the whole rom com list and tagged Adam Goldberg, French rom coms, Julie Delpy. Bookmark the permalink. Comments Off on 2 Days in Paris.